The pleasure sailing sector of the flourishing business of boat building in Italy, as well as the huge "giants", which have become real industrial groups employing hundreds of people and with incredible turnovers, also include a whole series of "lesser" realities that, precisely due their typically artisan based working method, manage to achieve amazing success, based on quality but above all on the higher level of personalisation they ensure for their boats. Ferdinando Amerio is the owner of one of these consolidated boatyards, the Permare Group, with 48 years of experience in the building and the assistance for boats of all kinds and therefore a great technician, able to evaluate the market, but above all the boats, their intrinsic qualities and their likely development in terms of hulls, engines, propulsion and so forth. First of all, I would like to know how you approach the construction of a new boat, what, if any, market surveys you carry out, what characteristics you give your bottoms, what relationship you have with interior design architects etc. The Permare Group reality is in my opinion well summarised by a recent advertising slogan of ours, where we compare our Amer 86 to a good suit, "sewn onto your body for your emotions". We quite rightly compare ourselves to a sort of sailing atelier, a "designer shop" where the client enters, sees the preliminary project for one of our boats perfectly defined from a purely technical point of view and therefore relative to the bottom, transmissions, weight distribution on board, division of the interiors etc. but with the widest faculty of choice for all the rest. 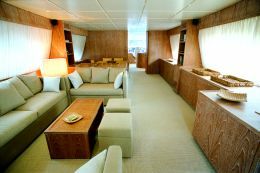 We could maybe think of producing a boat where the owner decides on the division of the interior space but in this case we prefer to remain anchored to our standards, to the layout that we have studied, undoubtedly the best both in terms of ideal use made of the space available and of the distribution of weight on board. 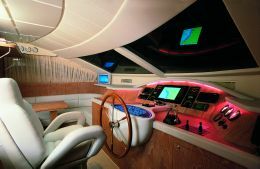 I assure you that the layouts proposed for our boats are normally accepted by all our clients, who, or rather whose architects, can then "have fun" choosing the kind of furnishing that best meets their needs, their taste. As far as the procedure followed when building a new model of ours, before designing it we obviously carry out the groundwork by market analysis: we look at tendencies, what the competitors have to offer in the specific segment where our boat will be inserted etc., although when elaborating a new project the relationship we have with our clientele remains fundamental. We are artisans, we make a small number of boats and therefore have a limited number of clients. 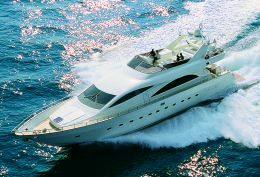 This, however, enables us to set up and maintain a very close relationship with them, which indeed often gives rise to ideas, suggestions or modifications to future motor yachts. The latest version of our 24 metre, on which we have recently carried out some important modifications, came to light in this way. We were informed that the previous model, when it anchored in the roadstead, seemed a bit "rocky" under certain weather conditions. This boat didn't actually roll more than other boats, but in certain situations she gave this impression. With this sensation to guide us we therefore recontrolled the whole boat's design. So you have tried lowering the hull's centre of gravity to obtain a better metacentre. Bacigalupo, the designer of the new bottom, had precisely this in mind and it is something that would have been impossible with the previous engine installations, for example with their classic shafting. Also the fact of having moved the propellers to the far stern undoubtedly offers us better stability against rolling, as does the adoption of a specially designed bottom, with a fairly narrow "V" to the bows, so that it "opens" the sea well when sailing but with an inclination of only 13° to stern. So even those bottoms rated as "good" should be given an overhaul every now and again. Without doubt, yet in practice this rarely happens. Still today there are boats out there using really old bottoms, from 30 or 40 years ago, while the topside, engines, accessories etc, are all made using materials and technologies of today. Looking for a comparison, it would be like mounting a modern day "common rail" on the framework of an old "Beatle". No problem, it would still go, but how well? In my opinion bottoms should be overhauled at least once every 10 years, cyclically, with hands deep in the barrel of modern technology. Its an expensive approach, that only a very few use, but undoubtedly the only one that offers guarantees for the seaworthiness of the hull. Talking of the future, how do you think engines and propellers will evolve? I think the most logical and feasible short-term evolution in the sector of super-yachts will be the inheritance of what is presently being used on merchant ships. I refer to the use of electric-diesel engines and transmission based on a 4/5 "foot" integrated system, something that in appearance is similar to "sail drive", positioned on the bottom, each one with its own nice propeller, or even a kind of "duo prop". Firstly on very big units that need lots of power when sailing it has been shown that the best solution is to adopt electric- diesel engines, decidedly more efficient even from a point of view of polluting emissions and consumption. The same goes for the above mentioned "feet" capable of rotating 360° on themselves so that they can also be used as manoeuvring propellers, with an efficiency that can in no way be compared with shafting, a particularly "wasteful" system, given that no less than 75% of the power produced by the engine is lost. I know for certain that many engine constructors believe in this type of technology and some, like Volvo Penta, are already experimenting solutions for application, starting with 350 HP and up. And what do you think of other propulsion systems presently being used? They will evolve but they will always be linked to a niche market: surface propellers are decidedly more efficient than shaftings, but their main fault is in manoeuvrability, not very popular with most people; while the development of the hydro-jet is in my opinion mainly slowed down by the high cost of the jet units, right up there with that of engines. Talking of consumption, do you think this represents an important factor in the purchase of a large boat or are owners of these super-yachts less interested in this aspect? Having the money to spend on a boat of this kind certainly does not mean that you are also inclined to waste it. So, I feel that consumption is an aspect that is always given a lot of consideration, which makes a difference. In fact it was one of the things that we wanted from our bottom, a low consumption. As I said, its planing efficiency is excellent but our quick work offers interesting performance also with displacement. Why, do some people sail with the hull displacing? Yes, especially when long journeys are called for and there may be problems with the boat's autonomy. At least, I advise everyone to do so, in the same way that I suggest trouble free sailing at night, when the sea is generally much calmer and not so busy. Modern turbo diesel engines mean best running at 1,500 revs and more. With a single engine at 1,500 revs our boat reaches speeds of 10 to 15 knots, depending on the load, the sea conditions, etc., still fully displaced and with gentle sailing, no stress. At that speed we manage to consume something like 7 litres of diesel oil per mile, a result that maybe even displacing classic ships can't attain at that speed. But is it right to cover so many miles, so many hours of sailing with only one engine? We mount a special inverter, self-lubricating even when not in use, and a series of stratagems like the capacity of carbon shafts, which enable also this kind of use.